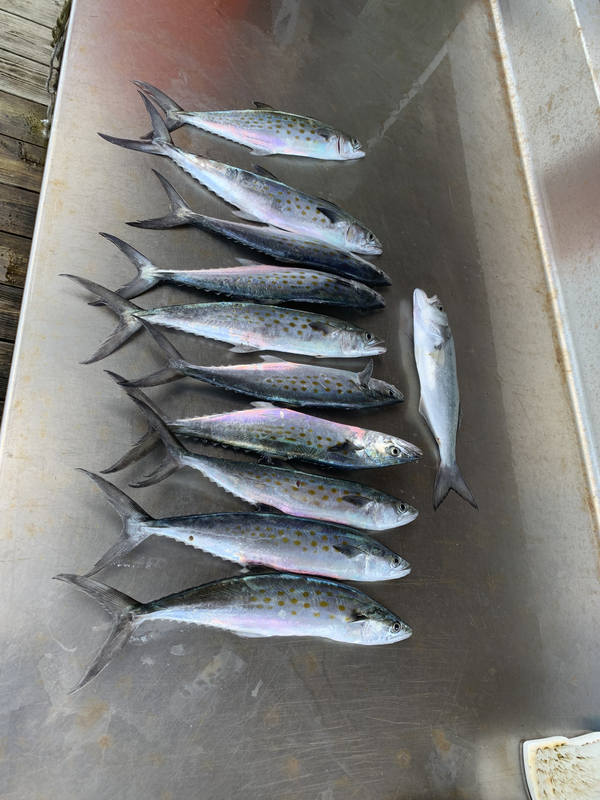 Trolled Clark spoons in the bird frenzy East of the North jetties today at 1230, and caught a lot of small Spanish. Did keep ten over 12". If there are birds hitting the water, there are Spanish and Blues there feeding on Glass minnows. Is this the Mayport jetties? THANK YOU!!!! I love catching these. I start taking my kids on them and they stay interested in fishing for a while. Plus my wife loves eating them. Same we live near the mouth of the jetties and love dropping the boat in and letting the kids get on them. I usually use inline weights, are you using planners or weights. A buddy only uses #1 planners and says he smokes them. The birds were hitting at the tide line so be there about 1/2 hour before high tide and wait for the tide change. Yesterday we (Lou's boat and friends) used #0 SeaStriker planers, followed by 10-15 yards of 30# floro, followed by a "Christmas" tree with 5 tubes and hooks, tipped with a #0 Clark spoon. Keep everything small, there feeding on tiny bait. Lou (LouD) and I have used this technique a lot over the years and find it very successful. If the birds aren't working, your probably only going to pick up a stray or so. We were catching 3-4 at a time on the tree. That's fun. You can see there is one Blue fish in the picture. Only caught a couple of those. So out going is key. I can’t remember. I started keeping notes three years ago. No notes on the Spanish yet. So if the weather gets better the tides are perfect for morning trolling and near shore bottoms fishing in the afternoon. I wouldn't target Spanish. I would fish for other species around the jetties area, and if you see a rip forming and the birds going to work, pull anchor and then jump on the Spanish. My experience is that predicting when a good rip will form based on high tide is difficult. Depends on too many different factors. Just my opinion. What do you mean by a rip forming? A tide rip where the clean ocean water meets the dirty river water. Outgoing river height and current, incoming ocean tidal height and current, strong winds, direction of winds, wave size direction of waves, period of waves; and then all that coming together to whip up a chaotic mess which we call a rip. Usually there is a strong upwelling with it, bringing up the bait to near surface. It usually forms where the dirty river water meets the cleaner ocean water, but not necessarily. There was no clean/dirty color line in our rip Monday, just a lot of heavy, green water chop. You'll know it when you see it. I have seen strong rips as far in as the Navy Base, but most form close to or just outside the jetties mouth, going out as much as a mile East. A strong ocean current can run North or South along the beach and has to get across a river flowing out due East. Especially a current from the North picks up speed as it crosses the shallow jettie rocks and slams into river water. That's what we were fishing in Monday. North side rips have always been more productive for me. They can b a lot fun and a little dicey in a small boat. Thank makes sense because I remember always finding them in the ruff water around there. My oldest daughter used to look for the “Chum bucket” when she was young saying that’s here the fish are. Obviously a sponage bob reference. She always said the fish where making the mater ruff. Guess she was wrong and correct at the same time.